It was clear from the outset that this design had to revolve around the beautiful scenery that surrounded the house . With the property architecturally designed using a mixture of wood cladding, anthracite metalwork and white render, the kitchen also needed to reflect this. The clients required seating at a breakfast bar overlooking the views and cooking options for entertaining and healthy eating. With it being an upside-down house, and the kitchen being on the first floor, initial impressions were form below, so the design needed to look impressive, walking up the stairs. 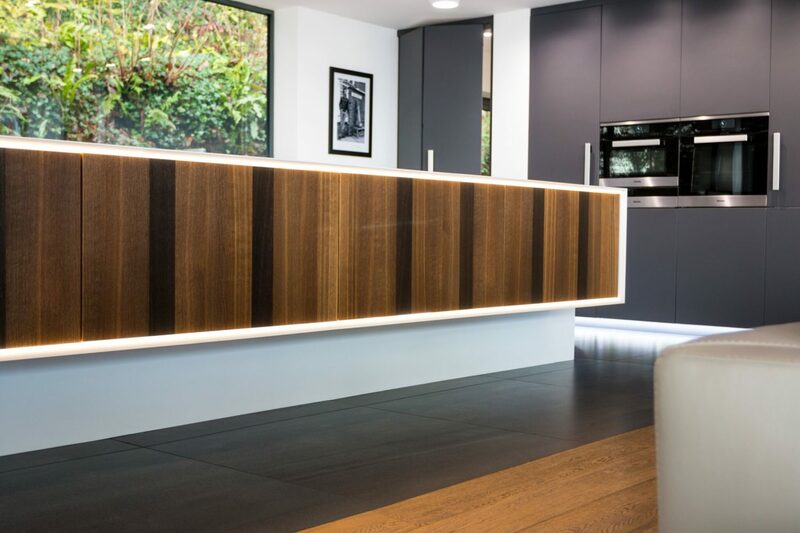 Incorporating the cantilever idea from outside, the smoked oak veneer units appear to be floating off the ground with a Corian column and wrap around worktop encompassing the dark wood. Keeping the scheme consistent, discreet bi-fold doors led through to the utility room, these were matching the matt graphite tall units. A concealed breakfast bar was included so that the clients could admire the view, whilst not disturbing the clean line aesthetic of the island. Placed on the working side of the kitchen, stools could easily be pushed under to avoid inconvenience whilst cooking. A unique design feature was incorporated with the use of diffused light and translucent Corian. The halo of lights surrounds the floating units, framing them effortlessly, this element offers ambient light and highlights the unique floating detail of this kitchen.